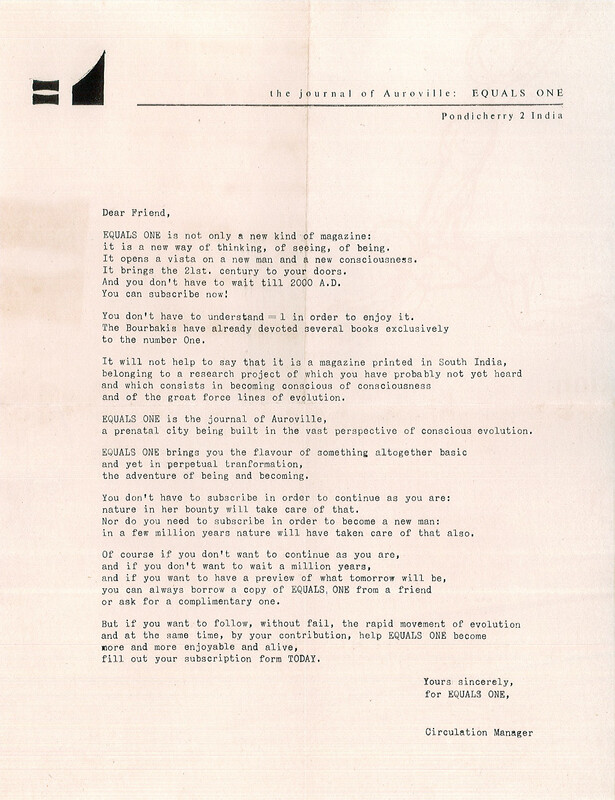 =1 "Equals One" was a journal created by Medhananda and Yvonne Artaud in the early days of Auroville. See "=1 history". “Equals One, which has been edited and brought out as a quarterly, is in reality a collection of essays and meditations about the most fundamental questions, problems and paradoxes of the thinking mind. Yet when this mind, through yogic discipline, reaches a state where all the uncertainties recede into a higher reality, then the enigmas and nightmares of the lower reality dissolve, thousands of years of schizophrenic, demonic fears, superstitions, occultism and primitive theology burst into the freedom and hilarity of a happy awakening.